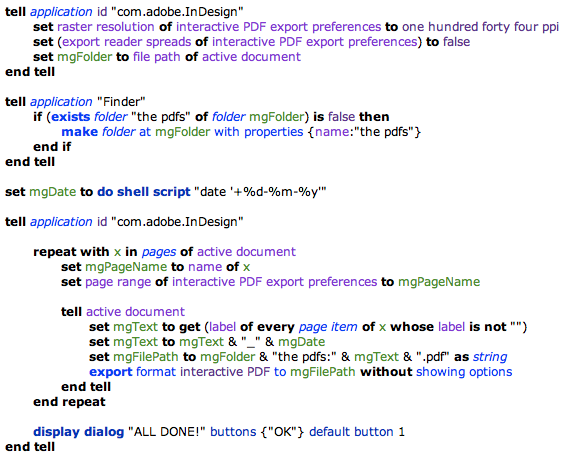 throughout this site (and others) you’ll find lots of applescripts which are direct responses to real-world workflows. but, chances are, you’ll need to do some cut-pasting, and additional code writing to create a script which does exactly what you want in your workflow. this can be a bit intimidating and not a little frustrating as you try to get the bloody thing to work. When I’m cutting and pasting sections of a script, how many ‘end tells’ do I need to include? one of the main problems with this kind of error, as compared with many other types of errors, is that Applescript Editor may not highlight the exact line where the problem needs to be fixed. the important thing to remember is that the number of ‘end tells’ will be exactly the same as the number of ‘tells’. but you can see that even here — all the commands get closed down in the reverse order that they were opened. the ‘repeat’ is closed first, then the ‘if’, then the second ‘tell’ and lastly the first ‘tell’. are there other scripting issues that keep cropping up for you? I’m using InDesign to manage 200+ pages of tech sheets for a company … The obvious benefit of using InDesign and having all the tech sheets in a single file is because then I can edit and update Master Pages and have the changes reflected in all of the tech sheets. 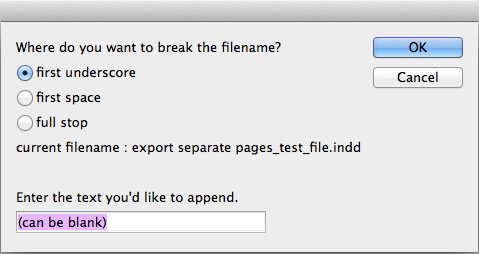 The major downside though is that when exporting the PDFs … the file name must be specified manually for each tech sheet. the alternative method allows you to specify a filename for each page without that filename actually appearing anywhere on the page — the invisible script label. script labels are awesome and were the key to the functioning of the calendars script. 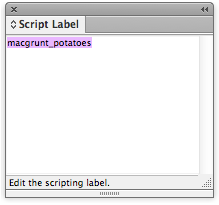 a script label can be assigned to any page item, but for this example we’re going to label the heading text frames. set mgDate to do shell script "date '+%d-%m-%y'"
ok, so there we have it — a few variations on the exporting-each-page-as-a-separate-pdf theme. hopefully, from this brief introduction, you can see that there are any number of ways to get the job done with applescript. there’s a solution out there for just about any workflow.